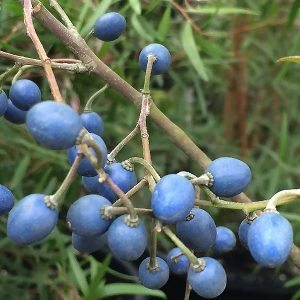 The ‘Blueberry Ash’ is Elaeocarpus reticulatus, a versatile small evergreen tree suited to a range of climates. It will grow well from cool southern areas through to sub tropical climates. It can be found growing along the east coast of Australia from Queensland through New South Wales and Victoria into Tasmania. 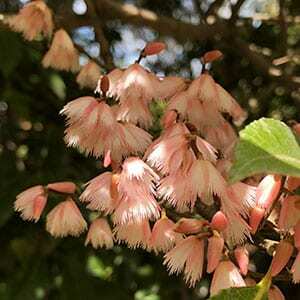 Growing to around 7m plus in height and with attractive pink ‘fringed’ flowers in late spring Elaeocarpus reticulatus makes a nice small feature tree. Because of the limited growth it is well suited as a street tree where it will not interfere with most powerlines. The root system is relatively non invasive and the Blueberry Ash can work well as a screening plant or windbreak. The foliage has an interesting fragrance, leaning towards liquorice. 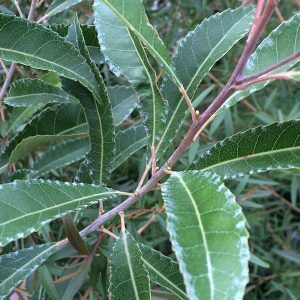 Frost resistant, growing well in full sun to part shade, Elaeocarpus reticulatus is readily available for sale and is probably a little under used in Australia. Excellent as an ornamental feature tree in medium to larger sized gardens. The Blueberry Ash also takes well to pruning and can be used as a screening plant or hedge. Dense foliage and good response to pruning make this a versatile landscaping tree. As a hedge, spacing at around 2 – 3 metres apart should be adequate. Root system is regarded as non – invasive and the Blueberry Ash will grow in poorer soils. Two forms are available, the white flowering species, and the pink flowering Elaeocarpus reticulatus ‘Prima Donna’. Easily pruned to size you can also use this tree as a screening plant or informal hedge. Because of the large leaves it prunes well, but does not look so great with close clipping on a regular basis. Hardy in a range of climates with a non invasive root system, this is a native plant that grows well in full sun to part shade. For best results and growth, a humus rich moist soil. However this is a relatively drought tolerant tree once it isestablished. Plants are available in a number of sizes, from around 1m in height through to 6m. Growth rate – Medium depending on soil and moisture. Spread – Will form a grown of around 4 metres. Position – Full sun to some light shade through the day. Root system – Recommended to plant at least 4 metres from sewers. Foliage – Glossy deep green evergreen foliage. Foliage will turn to reddish colour adding extra interest. Flowers – Attractive flowers from spring to summer. White or Pink and fringed, creating a delicate lacy look. Fruit – Flowers are followed by dark blue berries, hence the common name. Generally available for sale from seedling trees to ready to go 1 -2m specimens. Also available in advanced sizes to 6 metres from selected growers.